Will Apple's latest handset revolutionise pocket gaming? Is the 4S a fully-fledged gaming handheld? One of the key announcements in Apple's iPhone 4S press conference was the new handset's gaming capabilites - but how do its new features fit into the current handheld market? Running on the same dual-core A5 processor as the iPad 2, the 4S is said by Apple to have a seven-times increase in graphics capability. It also bumps the iPhone 4's 512MB memory up to a full gigabyte, which will give the phone more room to process all those complex vertices and shaders. At the core of the gaming experience lies an Imagination Technologies POWERVR SGX chip, which features pixel, vertex and geometry shader hardware, and supports OpenGL ES 2.0 and DirectX 10.1 Shader Model 4.1. Put simply, it's a mighty little chip, and we've already seen it in the likes of the Nokia N900, Sony Ericsson Vivaz and Samsung Galaxy S.
It's actually the same chip that's in the iPhone 4, but the 4S beefs it up to a dual-core model - named SGX543 - lying within the A5 system-on-a-chip, in exactly the same way as the iPad 2. The iPhone 4S isn't the only upcoming device to feature the chip, though. Sony's PlayStation Vita handheld also includes the processor - but in a quad, rather than dual-core flavour. The chip is capable of delivering 35 million polygons per second. To put this in perspective, Nvidia's top of the range GTX 590 is capable of a whopping two billion triangles per second. Of course, the Nvidia chip is designed to output to vast PC displays, whereas the most you'll get out of a handheld is a 1080p resolution on a connected screen - another new feature in the iPhone 4S. In terms of the current generation of consoles, the iPhone 4S could be catching up. The Xbox 360 and PlayStation 3 are capable of 500 million and 275 million polygons per second respectively - not far off the iPhone's figures. The company that's likely to be most threatened by the iPhone 4S is Nintendo. US Nintendo president Reggie Fils-Aime admitted that the 3DS struggled to "drive momentum" and blamed it on a lack of decent games at launch, but the success of the iPhone as a gaming platform has to have a part to play in this. CVG's deputy editor Andy Robinson told us that "4S is certainly laying down some serious credibility for the iPhone as a core gaming device. Not only is it now pushing out games that simply eclipse the 3DS visually, but features like cloud saving and TV streaming support are really exciting for gamers." The other problems with the 3DS are two-fold. 3D may have been putting bums on seats (and money in studios' pockets) in cinemas, but it's yet to find a proper foothold in gaming. The 3DS also doesn't have the communication abilities of the iPhone - why take two devices out when you can take - and pay for - one? This is where the PlayStation Vita comes in - and it's probably the biggest threat to the iPhone 4S as a gaming device. Its attraction doesn't lie in its hardware, but its communication abilities. Like the iPad, it's going to come in two models, one with Wi-Fi and 3G, and one without. Add to this the 5-inch touchscreen, touch-sensitive back and proper controls and you've got a killer gaming device - complete with social network apps. And although it doesn't include the ability to make calls or send texts natively, a Skype app enables this functionality. The PlayStation Vita is due to launch in Japan on 17 December - a couple of months after the iPhone 4S is unleashed. 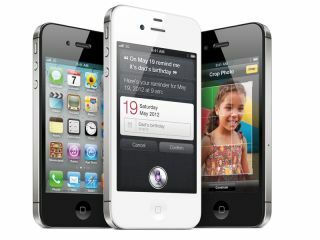 It will be far cheaper, too, coming in at around £235, compared to the 4S' £600-plus contract deals. The iPhone's other big challenger is Android. We've already seen dual-core Tegra Android phones such as the LG Optimus 2X, and they sport fairly meaty graphics capability. Ports of iPhone games are fast filling up the Android Marketplace, too, with some graphically advanced titles - such as Racing Moto - being released on Android first. Android has another ace up its sleeve with the Sony Ericsson Xperia Play. Although we weren't overly impressed with the phone, as a proof-of-concept it showed that back catalogues could be raided to bring nostalgia to the current generation. Sony also has a huge back catalogue of games and current licences waiting to be pimped out on its latest hardware - titles that the iPhone 4S will miss out on. The Xperia Play also packs a fold-out game pad, which allows for proper button-mashing and joypad-waggling. The iPhone's touchscreen maybe revolutionary, but it's certainly hampered the kinds of games you can play on the device, which tend to rely on swipes and gestures. Angry Birds - probably the iPhone's biggest success story - nailed the gaming experience, but it's hard to see where to go from there. Even the most complex of 3D iPhone games - such as the upcoming Infinity Blade 2 - tend to be fundamentally 2D in their controls and interaction. What's needed is a proper form of control, and for games to be developed around that. Some companies - such as Joystick-IT and iControlPad - make after-market joysticks, and it's somewhat surprising that Apple hasn't brought out its own sleek and shiny gaming peripheral. The other issue is quality control. Although the App Store does a very good job of filtering the best and most popular games, there's still a metric ton of Angry Birds clones out there. "If they can get some regulations in place for all the shovelware on the App Store then I'd be really worried if I was Sony or Nintendo," said Andy Robinson. Apple may have a released a substantial gaming device, but it's still got quite a battle on its hands to become king of the handhelds - especially if it wants to take on the PlayStation Vita.